It is officially fall, which is also my favorite time to bake all the cozy classics I've managed to avoid all summer. I love eating healthy whole foods, but cookies, crumbles, cobblers and pies are my vice. I recently stumbled upon Laura Lee's cookbook and website, llbalanced.com. I have been hooked ever since. 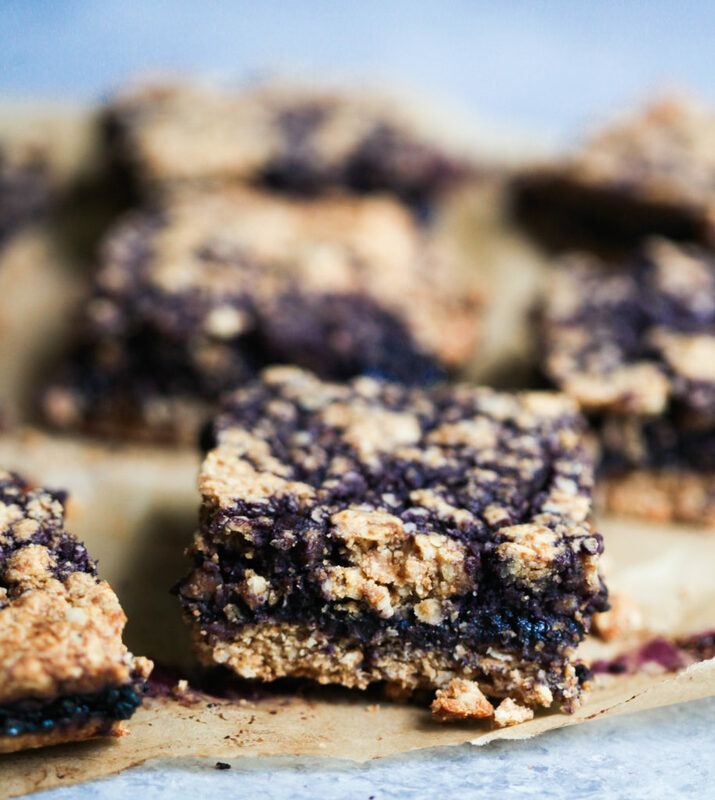 I am a fan of all things blueberry, so when she posted this blueberry crumble recipe on her blog this summer, I could't resist. I have cooked my way through her cookbook, everything I have made is delicious! It is in my top 10 favorite cookbooks HANDS DOWN. She is also fun to follow on instagram, I learn so much from her. We celebrated my 29th birthday (CRAZY!) this weekend, and instead of cake, I opted for this scrumptious little crumble. 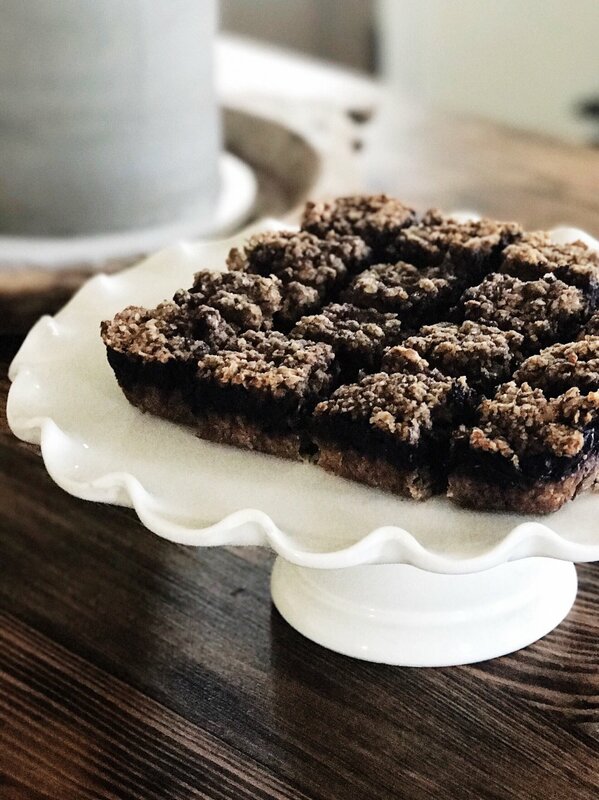 Laura Lea has also posted more crumbles and bars on her website, if you are in the mood for more fall appropriate flavors, you know, pumpkin. I love them warm or cold. Refrigerate them, and top your cute little crumble square with almond butter, for a yummy after dinner treat. It is the perfect amount of sweet to satisfy your craving, without being over the top...just try not to eat them all in one night. Check out llbalanced.com for step by step instructions and photos. Preheat oven to 375 and line an 8x8” baking dish with parchment paper, allowing an inch or two to overhang the sides. Add 2 cups instant oats to a food processor and process until they form a fine flour consistency (don’t clean). *If not using PB powder, add 2 1/4 cups to FP. Add oat flour to a large mixing bowl, along with remaining instant oats, sea salt, cinnamon, coconut sugar and peanut butter powder. Whisk to incorporate ingredients evenly. In a small bowl, whisk together melted butter, egg, peanut butter and vanilla extract. Pour over dry ingredients and stir until evenly coated. This should be a semi-sticky crumble—not wet but able to hold when pressed together. Add 2 1/2 loose cups (approximately 2/3) of the crumble mixture to the bottom of your baking dish and pat firmly into an even layer. In your food processor, combine all blueberry filling ingredients. Pulse just until it forms an icy crumble—you won’t see blueberry chunks anymore, but you don’t want it to liquify. Scrape blueberry mixture onto baking dish and spread in an even layer. Top with remaining crumble and press it down gently. Bake crumble for 40-45 minutes, or until edges are golden brown. Remove from the oven and allow to cool at least 30 minutes before slicing with a very sharp knife. Allow bars to cool completely before storing in an airtight container. Bars will keep for 48 hours on the counter or 5 days in the fridge. I personally like them best straight out of the fridge! *TO MAKE A FLAX OR CHIA EGG: combine 1 tbsp flax meal or 1 tbsp chia seeds with 3 tbsp water and allow to sit 10 minutes or until gelatinous. Then just add this when you would add the egg, per instructions. Thanks LL for this yummy recipe!